Simple and slim, this modern brushed nickel floor lamp features twin pull chains and a double shade. Complete any space stylishly with this simple yet stylish floor lamp. The base, pole, and finial feature a sleek brushed nickel finish. Topped with a designer double layer shade. Twin pull chains add a convenient touch to complete the design. 65 1/2" high overall. Base is 12" wide. Shade is 17" wide x 11" high. Weighs 18.7 lbs. Uses two maximum 75 watt or equivalent bulbs (not included). Twin on-off pull chains. 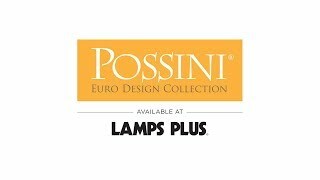 A streamlined and modern floor lamp by Possini Euro Design®. Sleek brushed nickel finish on the base and pole. Double layer linen and sheer shade. 7 1/2-foot long silver cord. It is compatible with other lamps and is a clean simple design. The right style and finish. The positive reviews made a difference too. Style we’ve searched for contemporary but fits with older furniture good height. Unique shade, sleek design and price. I have been eyeing this lamp and it is on sale. Minimal and simple and looks nice. The pull chains are perfect. Plus....... I read the reviews and was impressed. Thank You. The look was modern and clean. I love the top part it is very unique. Sleek, clean design. Looks like great value. I have a dark corner of the bedroom and I feel this will perfectly brighten it up. The lamp has simple lines and shade. It will maintain my modern and open living room concept and add simple light. I needed the stainless to match other fixtures and appliances. I needed a heavy base to be stable as the lamp will be near an area where people walk. And the price was right! Looked like exactly what I have been looking for at a great price. And all the reviews were very positive. Soft contemporary style is perfect! The finish and shade were perfect for my space. What is a double shade? Exactly what is sounds like. There are two shades, one inside the other. There is about 1 inch of space between each on. We love ours. Hi just bought two of these lamps but don’t love the shade. What size shad can I buy as a replacement?? Does the shade have a top or bottom diffuser? BEST ANSWER: For this floor lamp it dose not have a diffuser .. it is open at the top and the bottom . Have a amazing day . No, it doesn't The sides of the shade are vertical with no shading on the top or bottom. Can I use a Alexa smart plug to turn this lamp off/on? I have an old floor lamp that I leave on, Alexa just turns the lamp on/off when needed. BEST ANSWER: Yes! I have mine on a smart plug. You’ll just have to decided to have one bulb on or two with the pull chains and leave it that way, so the switch turns on the number of bulbs you want lit. Does this have a 3-way switch? BEST ANSWER: Hi, no it is an on/off switch only. The light does not have a three way switch. It has two pull cords that light a bulb on each side. It provides plenty of light in our living room. It is a well made and a beautiful lamp. I have been very happy with the quality, design, and amount of light it provides. BEST ANSWER: The inner shade is white with an outer sheer white shade. Inner shade is pure white and outer shade is a translucent shade that appears to be sheer fabric but it is plastic coated in a fabric. It’s a beautiful lamp! I love mine. Both appear whitish to me. They do not seem to be cream at all. Hope this helps. What color is the Organza Part of the shade? I saw that the inner shade is white. Thanks!! BEST ANSWER: The organza shade is clear. This lamp is stunning! The outer part of the shade is sheer and a beautiful very light silvery gray. It is excellent quality, and I would highly recommend it! Thank you! Can't wait to get it! It is not perfectly clear. The organza is a very tight weave and looks silvery stretched over a clear plastic shade. Organza part of shade is clear with a brushed finish so white inner shade is visible. Very nice lamp..
What the outer shade made of? What are the dimensions of shade? BEST ANSWER: Hi - the drum shade is shade is 17" wide, 11" high. Looks and feels like a quality lamp. Beautiful, elegant lamp with clean, simple lines. Looks and feels like a quality lamp and sits perfectly straight. The inner shade is a pure white, the outer shade is a smoky light gray. Looks great with one or two bulbs lit as no shadows from the bulbs are visible - this pic is with just one bulb lit. Easy to put together. Very pleased. This lamp is stylish and well made. Totally worth every penny! Love this lamp. Good quality. I bought at the store and the salesman was so awesome! I purchased 2 of these when they were on sale. One arrived with a major blemish on the pole. LampsPlus quickly processed my return and replacement. The shades are wider than I expected, but still look great in my mid century living room. Often this style of lamp does not have a heavy or wide enough base to prevent wobbliness or tipping. The base on this is wide and sturdy. Pole lamp matches the dinning room fixture. Looks gbeautiful in my great room. We purchased a pair of these. We love the look. The only reason the rating is not 5 stars is because one of them did not go together correctly. The threads for the piece that holds the lampshade did screw on smoothly and required excess force to tighten. The other worked correctly. Beautiful lamp that is well made. Modern design fits well with decor. It puts out a good amount of light. Beautiful lamp. The double shade and overall quality were great. The Roxie brushed steel floor lamp is perfect for my home office and reading area. I love the height which enables the light to bathe a wide area with soft but effective illumination. The simple lines fit with my eclectic decor. Perfect with my décor and also matches my chandelier. This is a nice sturdy lamp for the money. Love It! it's good looking and adds momentum to the room. Double shade provides bright but soft lighting. Modern look. Beautiful, elegant and sophisticated without being obnoxious. This lamp was super easy to set up and I love how it looks in my new living room. It goes great with my new decor and I would definitely buy from this company again. The lamp is very pretty and the shade makes it special. Good source of light and sturdy base. Very easy to assemble. I had originally bypassed this lamp because the price point was low so I thought it would look 'cheap'. Bought another at more than double the price, didn't like it, so took the gamble on this one. Looks fantastic, sophisticated and of good quality. The one thing I look for in a floor lamp is something sturdy, not wobbly, and not easily knocked over. This lamp meets that criteria. All parts are of great quality and I'm happy with purchase. Great design and the double shade thing is a first for me but gotta take chances in life. It paid off this time. Thanks Lamps Plus! Not having ordered from this company before, or ordering lamps online I was. A bit concerned that they might be 2nd rate. This lamp is beautiful, heavy, and sturdy. Shipping was quick and the lamp was packed very well. I gave it only four stars because the post the lamp shade sits on was a bit bent. Because they are so heavy and sturdy there was no bending it straight. No one can tell that it is slightly crooked but me. I love the look of this lamp. It’s just as pictured. My shade I think is a little tiny bit lopsided and I’ve tried to adjust it but I do love the lamp. Hi Ripley B., sorry to hear that you had trouble assembling your floor lamp. We do hope you're enjoying your design now, but should you ever need assembly assistance in the future, our customer service team can direct you to our technical support team, who can walk you through the process of installation and assembly. Please reach out to them via phone, email, or chat if you have any questions. Thank you. Because they sent the wrong part to put it together. After emailing back and forth with customer service for weeks, I was told the warehouse couldn't send me the correct replacement part and would have to send me an entirely new lamp. Incidentally, through this process I came to realize that the diagram I had to assemble it was completely different than their diagram and the part numbers were labeled differently. I was missing part C but it was labeled a different letter on their diagram, so as you can imagine, this complicated the communication process. The warehouse and the company have lost all credibility with me and I declined to be sent a new lamp. I just cancelled the entire order. Hi Lisa P., so sorry for the confusion and frustration this experience must have caused you. We sincerely apologize and hope that you will reconsider shopping with Lamps Plus in the future. Thank you.